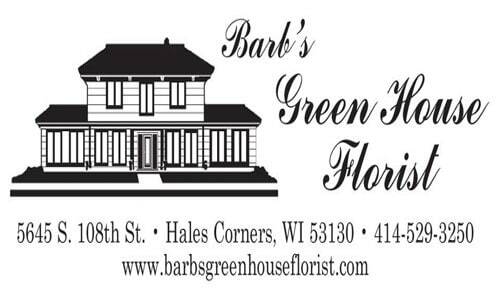 Barb's Green House Florist proudly serves the Hales Corners area. Your floral experience here has always been a tradition of excellence. Our knowledgeable, imaginative and passionate staff of professional designers is capable of filling your floral expectations along with understanding budget concerns. M-F 9:00 a.m.- 5:30 p.m. Sat 9:00 a.m.- 2:00 p.m.
Our shop will always be closed on the following holidays: Thanksgiving Day, Christmas Day, New Year’s Day, Easter, Mother’s Day, Father’s Day, Independence Day and Labor Day. If demand allows, we do close Saturdays for holidays as well. Any delivery going to a zip code not listed will be wired to another shop. A $18.95 service fee will be added to any order going outside our delivery area to cover the wire service fee and the delivery charge for the sending shop. Please call us if you have any questions. Our shop is right around the corner from Hartson Funeral Home and Advantage Funeral Home. We also service other area funeral homes. If you have any questions or need more information, please contact us directly toll free at (888)548-1998, locally at 414-529-3250 or email us at bghf78@yahoo.com. We're always here to serve you and make your flower-sending experience a pleasure. During our off-peak season (non-holiday) we will do everything in our power to accommodate same day deliveries received as late as 12:00 p.m. Due to the volume of deliveries during our peak times, we cannot always promise this. Deliveries within a specific, small window of time are possible at an extra charge. Again, this may not be available during our peak times. Please contact us for deliveries within a specific time frame. Delivery times on orders being made outside our delivery area cannot be guaranteed. We are unable to make deliveries on Sundays. Deliveries requested on this day will be delivered the following business day. Delivery of orders to rural route addresses or cemeteries cannot be guaranteed. To help assure on-time delivery during the busy holiday season, place your order at least 3 business days prior to the following major holidays: Thanksgiving Day, Christmas Day, New Year's Day, Valentine's Day, Easter, Administrative Professionals Week, Mother's Day, Memorial Day, Father's Day, Independence Day and Labor Day.